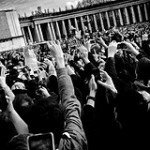 50/365 – “Habemus Papam” nr.22, a photo by Luca Rossini on Flickr. 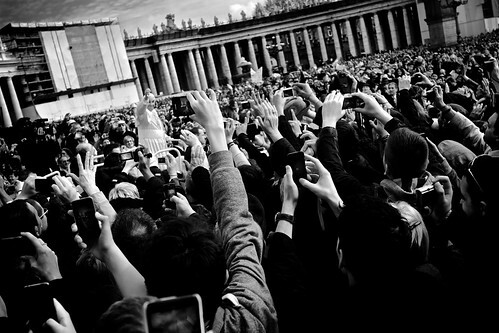 At his already second “Wednesday General Audience”, Pope Francesco used again the Papa-Mobil to drive through the crowd that, as usual, gathered to see him. Fifty thousand people, quite less than at each of his previous appearances, still quite a lot of people if you think about it. The crowd went crazy every time he got closer, with thousands of hands raised (to take a snapshot with phone cameras). And again, and as usual, Pope Francesco didn’t miss the chance to greet the crowd with another of his signals for a renewing Catholic church. “In the Church, and in the journey of faith, women have had and still have a special role in opening doors to the Lord” the Pope said, and then he went on with a story which may seem like a technicality, but which actually could be his major theological revolution so far, the bottom line of which seems to sound like: the different role of women in the history of the Cristian church is due to human judgments, distant from those of God. If this speech was intended to pave the way towards female priests is too early to say, but sure enough it sounds like a first step in that direction has ben walked.